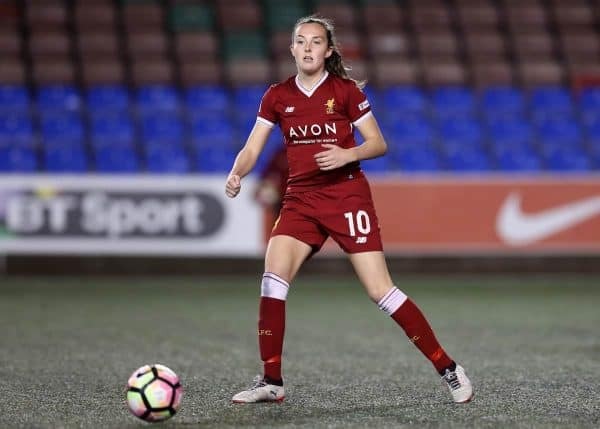 Liverpool Ladies midfielder Caroline Weir previews the game against Birmingham and discusses the influence of teammates Bethany England and Natasha Harding. The Scottish international has been busy taking part in the FA Girls Football Week initiative – providing coaching support across the UK for young girls. The initiative aims to bring more girls together playing football and hopes to inspire them to take up the sport professionally. “It’s great to have something like the FA Girls Football Week. It’s something I didn’t have growing up and that shows how much the game has grown,” Weir told This Is Anfield. “It’s good just to see young girls all enjoying football together so as professionals we’re really happy to get involved whenever we can. While keeping busy with off-field duties this week, Weir has also been preparing for Liverpool’s next match against Birmingham on Saturday. The Reds were held to a goalless draw in normal time of their Continental Cup clash against Durham on Sunday. 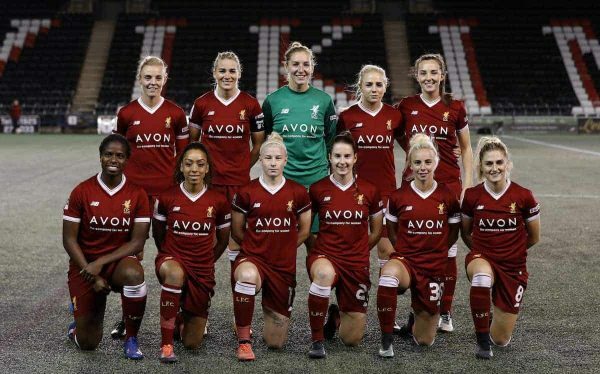 Weir admitted it was disappointing not to take all three points against the WSL 2 side but Liverpool were awarded two bonus points for a victory in the penalty shoot-out. The midfielder is now already looking ahead to welcoming Birmingham on Saturday and she is “confident” Liverpool can record their third league win of the season. “We should be beating teams the league below us so obviously we were disappointed not to get all three points but credit to Durham for making it hard for us,” Weir said. “They made it difficult and put up a good fight but we wanted all three points. “Birmingham are a very tough side to beat too because they are well organised and well-disciplined so we need to break them down. “We need to be able to create chances and we have done that in recent games against Sunderland, Sheffield and Durham. Liverpool have strengthened throughout the summer and now have even more firepower in attack after England U23 international Bethany England made the switch. Her influence has been highly noticeable and she already has two goals in six games for Liverpool – only Weir and Natasha Harding have scored more. “Beth (England) has been a great addition for us,” said Weir. “Beth is very physical and plays direct which is something we perhaps lacked before. She brings that side to our team which is something different. “It’s also provided great competition for places within the squad. Weir hopes England will be one of the players Liverpool can turn to in order to create chances against Birmingham. As well as England, Weir was full of praise for attacking teammate Harding, who has scored five goals in as many games this season. Harding grabbed a hat-trick against Sunderland a few weeks ago and Weir appreciates having someone like her to pass to. “Tash (Harding) has always been a threat for us and she has again this season. It’s great to have that up front,” Weir praised. “It’s especially nice for me to have a player like her, who makes lots of good runs up front, so I have someone to always pass the ball to. Liverpool take on Birmingham at the Select Security Stadium on Saturday, November 11. Kick-off is at 5pm GMT. The FA Girls’ Football Week runs from Monday 6 November to Sunday 12 November and gives students the opportunity to stay active in a fun and sociable way through football. Find a session near you at www.FAGirlsFootballWeek.com and share your experience using #JoinOurSquad to win exclusive prizes.